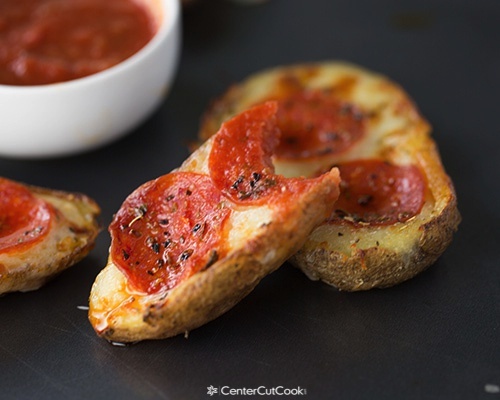 A fun take on classic potato skins featuring mozzarella cheese, pepperoni, Italian seasoning with pizza sauce for dipping! There is almost always a story behind each and every recipe that appears on CenterCutCook; some more meaningful and sentimental than others. 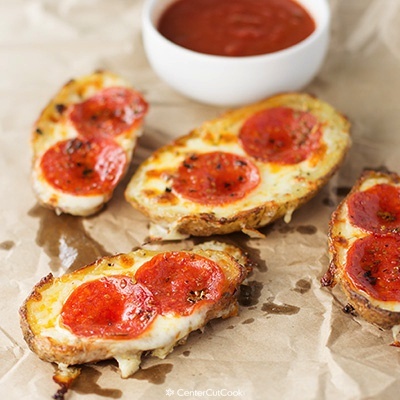 Would you like to know the story behind these amazing little Pizza Potato Skins? This story falls under the “not sentimental AT ALL” category. Ryan is all about technology and has a love for gadgets, and all things Android (Android is a mobile operating system). So when one of the Android sites that he follows, Android Central, announced that they were having a food photo contest, he persuaded me to enter. The only catch? The photo MUST be taken with an Android phone! I’m used to using my Canon 5D Mark III for food photography, which is oh so significantly different than the camera on my phone. I was pleasantly surprised though at how well the photos turned out! The images you see above were both taken with my Nexus 4 phone. On the left is the original un-edited photo which I then opened up in a photo editing program called Adobe Photoshop Lightroom to touch up a bit. For those of you curious what I edited, I adjusted the white balance, cropped the photo, and adjusted the exposure just a smudge. That’s it. The photo was taken under good lighting conditions which makes a huge difference. Once I snapped a few pics with my phone, it was time to bring out my trusty DSLR camera which I absolutely adore. Here’s hoping my cell phone pics make me (errrr Ryan) a winner! I don’t even know what the prize is, but I’m certain it’s something geeky that would complete him. 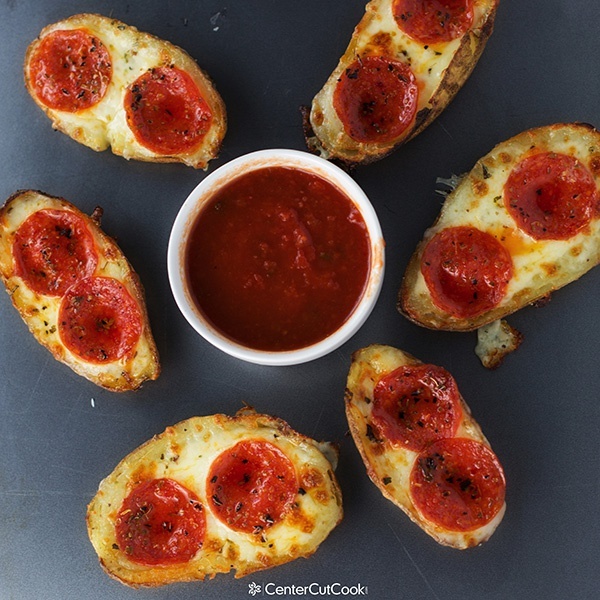 Let’s quickly talk about these Pizza Potato Skins. If you’re looking for a potato recipe for the kids, or even to serve to a crowd, this is such a fun recipe! I started with my favorite recipe for Loaded Potato Skins as my base. If you need a visual on how to do some of the steps, go check out that post because there are how-to pictures. In place of sharp cheddar cheese, I used gooey mozzarella cheese and in place of the bacon, I used pepperoni. To finish them off, I sprinkled Italian seasoning over top which has basil, oregano, and some other great seasonings that make these potato skins taste like pizza! And of course, you need pizza sauce in place of sour cream for dipping! To help speed the process along, I baked my potatoes in the microwave. However, feel free to bake them in the oven if you wish! 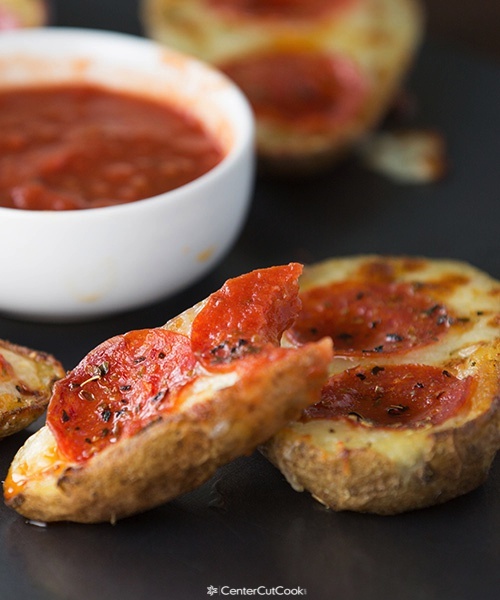 They work fantastic as an appetizer, and I have to say, for as much as I love loaded potato skins, I thought these Pizza Potato Skins were just as tasty! Pre-heat your broiler to high. When your baked potato are cool enough to handle, make two cuts down the potato lengthwise so that you are left with three pieces. Discard the middle slice of the potato (or save for other use) so that you are left with just the ends of each potato. Use a spoon to slightly scrape some of the pulp out of each potato skin so that you have only about 1/4 inch of potato left. Refer to this recipe for Loaded Potato Skins for photos to help you with this step. In the microwave, melt 2 tablespoons of butter (30-40 seconds does the trick). Brush both sides of the potato skin with the melted butter. Lightly salt and pepper the potato skin and place in the broiler for 8 minutes, flipping the potatoes once after four minutes so that each side of the potato is able to crisp up. 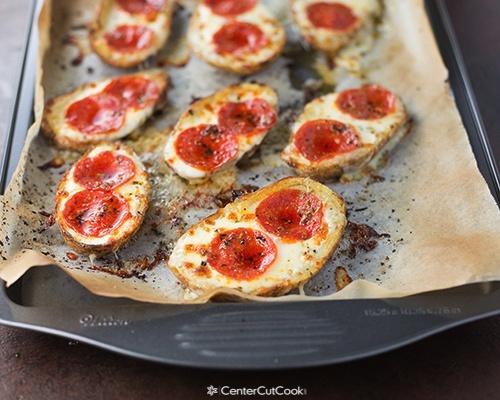 Take the potato skins out of the broiler and top with shredded mozzarella cheese and two pepperoni slices per potato skin. Sprinkle each potato skin with Italian seasoning. Place the potato skins back in the broiler for another 2-4 minutes, or until the cheese has melted. Serve with pizza sauce or marinara sauce on the side.